I'm a ~2240 CFC and ~2200 FIDE rated player and have been playing in tournaments for 16 years; starting when I was 7, and hitting 2200 CFC for the first time at the age of 15. Since then, however, my activity has gradually decreased due to lack of time and opportunity: this is the first year since 2009 in which I've played in more than one tournament. I'm now starting to get back into chess a bit more, having just played in the Canadian Open where I surprisingly turned in one of the best performances of my career. Due to lack of activity and not spending a whole lot of time preparing (the only preparation I really did was some tactics on Chesstempo.com and right before each game) I came in without really any expectations. In this post I've analysed two games; one in which I play someone rated a few hundred points below me, and in the other I play an IM. 2) Copy and paste the raw moves into http://www.chess.com/analysis-board-editor.html (just the moves are in spoiler tags at the beginning of the games; this is what you have to use) I don't believe it's possible to paste the analysis in as well, however. You will have to alt tab or have two windows open or something crazy like that. 3) Using a board and pieces. This is inadvisable because it is not on the internet, and stuff that isn't on the internet is dumb. 1.e4 c5 2.Nc3 The Closed Sicilian is quite possibly the best opening ever, which is why I've been playing it for like 14 years. For a while I played the Open Sicilian as well with decent results, but then stopped playing it due to forgetting all the theory in every line. 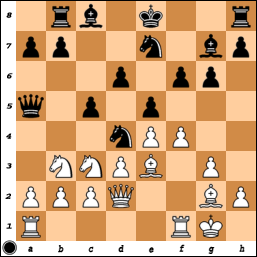 2...a6 2...Nc6 is the main move. 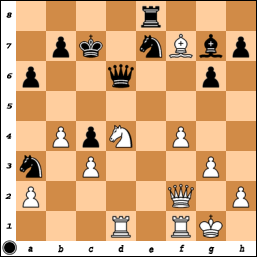 3.g3 g6 4.Bg2 Bg7 5.d3 Nc6 6.Be3 d6 7.Qd2 Bd7 Black's play feels very odd here. A very early a6 should be followed with b5 and putting his bishop on b7. 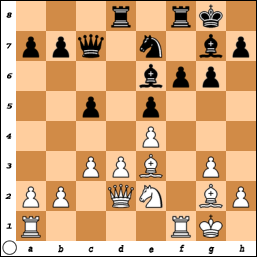 Instead, a6 has done nothing to improve his position and in fact may weaken it later, and his bishop isn't as active on d7. Bf6?! 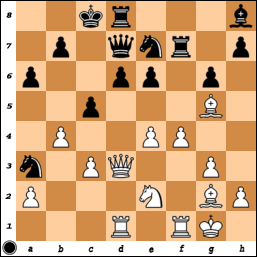 If black's plan was to castle queenside, then 9...Qc7 followed by castling immediately made a lot more sense. Now black's bishop is a target on f6 and he no longer has the option of playing f5. [10...0-0 11.h4 Bxh6 (11...f5 12.h5 Rf7 13.hxg6 hxg6 14.Bxg7 Rxg7 15.Qh6±) 12.Qxh6 f6 13.Qd2²] 11.0-0 Qc7 12.c3 0-0-0± Black's position just slowly deteriorates from here. Ultimately, this was a game in which black didn't have a good enough understanding of the opening and never managed to recover, blundering in a position in which he was already clearly worse. It always surprises me how many people don't understand how to play against the Closed Sicilian, which is another reason why I love playing it so much. 1.e4 c5 2.Nc3 For some reason I get white two games in a row, which turns out excellently, since I get another CLOSED SICILIAN. Truly a miraculous day. 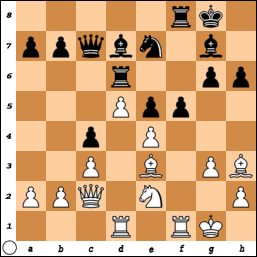 2...Nc6 3.g3 g6 4.Bg2 Bg7 5.d3 Rb8 6.Be3 d6 7.Qd2 Qa5 7...e6 and 7...b5 are more common moves for black, but ...Qa5 can cause some problems for white as well. While I managed to get a draw against an IM, I don't feel that I played well enough in this game. A missed opportunity to gain an advantage in the early middlegame and not calculating or understanding the position well enough when I played 18.d4 aren't mistakes that I should be making. However, this game does serve very well as a learning opportunity, and I know that I'll be better able to play these sorts of positions in the future. i wish i understood chess for what it actually is. i know how to play but thats about it, not much strategy. all i can do while reading this is notice the similarities to starcraft. Glad to see someone else posting reasonable chess stuff. I've been looking at playing some tournaments in Canada, but other than Edmonton (not interesting from a traveling point of view) and the Canada Open (too slow of a schedule to make it worth taking off days), what events are worth going to? I think trying to play the closed sicilian in a pure way at your rating is going to start getting a little harder and you can get a pretty big psychological edge by being willing to opportunistically go for open sicilians against certain lines. Was your second round opponent an older guy? Seems like 2290 is really weak for an IM. I also think his opening was inconsistant. 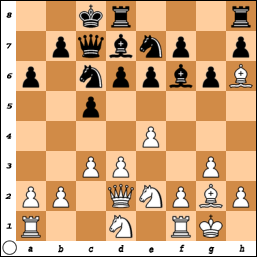 generally players either skip d6 and play Rb8 to play a fast b5-b4 or they go for d6/a6/b5. It's perfectly fine to meet Be3 with b5. 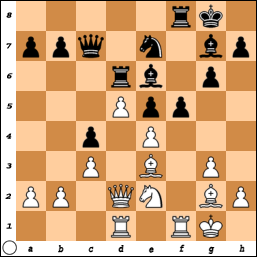 You can take on c5, but I think it's not considered good after b4 when black gets a huge initiative. Yout should be aware of this line, it is the whole reason for that move order. Qa5 looked really suspicious to me, black just looks far behind in development and this really doesn't help. I don't think defending c3 was strictly necessary, Bxc3 is not a threat. I get that e2 is a normal enough move for the night, but considering you know that black is going to castle kingside eventually might make sense to start with something else like f4. He can still continue Nd4, but then I think Nf3 is probably a stronger option. Somehow I want to have e5 in the air and even if I have to play h3-g4-f5 that attack line could still be strong too with your lead. I'll be honest, I didn't like your Nc1-b3 plan, just seems so wrong. The knight on d4 is strong, but it's black's only good piece, in the mean time you put your knight on the wrong side of the board and away from the center. I think I was struggling with a similar problem not long ago where I wasn't forcing myself to look forward. I think it generally comes from being overly positionally focused (I had this problem HARD for a while). Kind of like when you played Nc3-e2 it also struck me as backwards. Don't get me wrong, sometimes backwards moves are correct, I have no problem with the typical Nd1 followed by c3 plans in the closed sicilian. It's possible, but as I'm not seriously trying to become a GM or anything, I don't think it'll really become an issue. It's probably my most successful opening, so I think time would be better spent tightening up my other openings, as I've forgotten a lot of theory in many of them. Yeah, the FIDE rating chart only seems to go back to 2000, so I can't see when he first became an IM. I had a line with a really fast b5 without d6 against Pascal Charbonneau where he delayed Bg7 as well (http://www.chessgames.com/perl/chessgame?gid=1311661). According to my tree though, Rb8 and d6 are pretty normal. 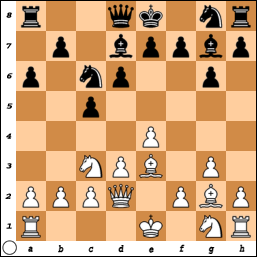 I think either line is fine; Nf3 does make it more difficult to get rid of the queen on a5, though. 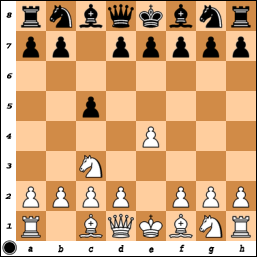 Nc1-b3 is very normal in this line; white does spend a lot of time moving his knights around, but at the same time, black's forced to spend time moving his queen and knight around as well. 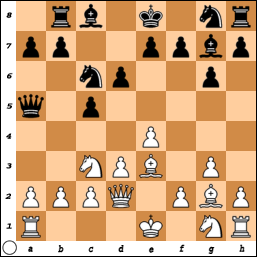 In a lot of lines, after Nb3 white will play Nd1, c3, Nc1, then move his knights back to e2 and f2. 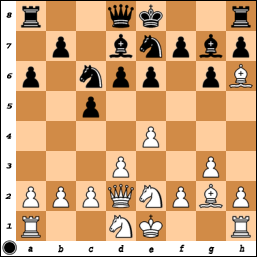 Without going for this plan, a lot of white's pieces are just locked down defending and mobility is made very hard.